The Casa Marina is a member of the exclusive Historic Hotels of America, and is the only historic hotel in Florida that sits right on the beach. It opened in 1924 during Florida’s first land boom, when Hollywood royalty lounged on Jacksonville Beach. Today, the restored hotel is extremely popular for beach weddings because of its great location, and the supreme personal service of its wedding staff. If you’re planning a wedding here, you can rest easy that the staff will take care of everything from the ceremony to the reception meal. The beautiful beach makes for a wonderful romantic setting, especially at sunset. Casa Marina is also a great place to stay for your honeymoon. Enjoy the delicious Sunday Brunch in the hotel’s restaurant. Or enjoy live music and cocktails in the rooftop Penthouse Lounge, overlooking the Atlantic Ocean. If you’d like to go off property, it’s just a three-minute walk to the Pier Restaurant and Sandbar , for a romantic dinner on the beach. Just a short drive away, you can stroll the shops and restaurants at Jacksonville Landing ; or take a romantic horseback ride along nearby Ameila Island. This is a good time to visit the Casa Marina Hotel & Restaurant during its “Fall in Love Package,” which includes chocolate-dipped strawberries and champagne, along with a standard deluxe room for $99, or a two-room parlor suite for $129. 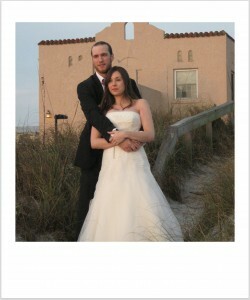 For more information, contact Catering Director Rebekah Blakely at 904-270-0025, or visit www.casamarinahotel.com.